The Upgraded Double Twin Room features two twin beds and can house up to 2 people. This guestroom showcases a minimalist style with simple furnishings including flat screen TVs, dresser, and large closets. Housed in a Victorian style building with high ceilings and classic San Francisco architectural detail, the Minna Hotel provides an authentic experience for all types of travelers. 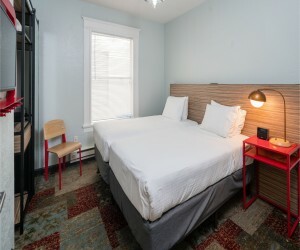 The upgraded double twin room is our renovated version of the 2 Twin Bed Room. All of our rooms come with shared bathrooms which consists of roll-in showers or tubs with grab bars. For more information on our hotels accessibility please visit our dedicated accessibility page. Flat screen TVs, WiFi, dresser, and large closets.